Do you suffer from severe or frequent headaches but hate taking pills? If so, then this video of using acupuncture points to relieve the pain may be of use to you. 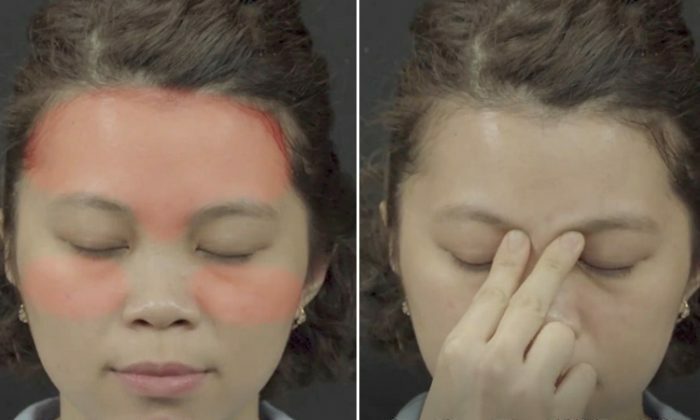 This video features five ways of using acupressure points to relieve sinus, migraine, neck pain, cluster pain, and tension headache. For sinuses, use the tips of your fingers to press the drilling bamboo point and apply pressure for at least one minute. Then, move your hands down to below the eyes and press and move in a circular motion. To alleviate pain from a migraine, press the third eye point firmly for one minute, and then use your thumbs to massage the heavenly pillar points located at the back of your head halfway between your ear and spine. Nowadays, people often sit in front of a computer for prolonged periods of time, which can lead to bad posture and neck pain. If your neck aches, press the wind mansion point and massage gently for two minutes to help with the stiffness in the neck. To bring relief from a cluster headache, apply pressure on the temple for five seconds with your thumb and index finger. Next, apply deep pressure on the Zhong Zhu point, located on your hand, for five seconds. Repeat with the other hand. Do you also suffer from tension headaches? Be sure to watch the video for the instructions on which acupuncture points help to allay pain for this. Further research will explore if migraine headaches are an early indicator for later-life carpal tunnel syndrome.